The upcoming 7-seater SUV by the Indian carmaker will hit the market during the festive season of Diwali. 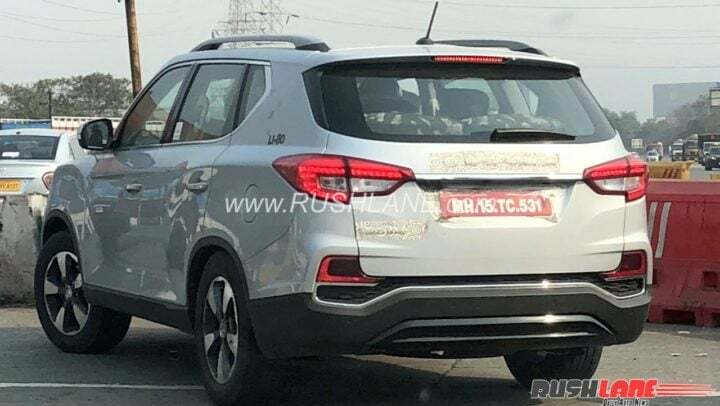 What’s essentially a rebadged Ssangyong Rexton, will retail under Mahindra brand name in India. Mahindra showcased the upcoming 7-seater premium SUV, nicknamed XUV 700 at the 2018 Auto Expo. What essentially is a rebadged Ssangyong Rexton for the global market, will go on sale this year. While the SUV was on display at the recent expo, the company officials failed to comment about the name of the upcoming premium SUV. Apart from the XUV 700, Mahindra is all set to bring in a brand-new premium MPV and a Ssangyong Tivoli based compact-SUV. Want to know more about the upcoming Mahindra XUV 700, read along. The latest entry in the premium full-size SUV market will be the upcoming Mahindra XUV 700. The SUV is expected to hit the market in the festive season of Diwali. The same was showcased during the Auto Expo but the final name of the SUV is yet to be released. Also Read – Huge discounts on Mahindra SUV, check here! The Mahindra has signed a pact with Ssangyong to import their models in India via CKD route and assembling them locally at their manufacturing plants. The upcoming Mahindra XUV 700 will be brought in as a CKD model and would attract less customs duty. Considering the competitiveness of Mahindra and the pocket-friendly nature of the Ssangyong, the upcoming SUV will launch around the INR 25 lakh price. The spy shots shared above showcase the upcoming Mahindra XUV 700 testing in some part of Maharashtra. Since the vehicle has already been showcased, the automaker wouldn’t prefer putting on the hefty camouflage. The badges, although hidden under the tape, surely doesn’t say Mahindra as the Indian automaker prefers to place the logo. Even the name badge has been covered and we are guessing it says Rexton followed by the variant. The upcoming Mahindra XUV 700 is Mahindra’s answer to the Toyota Fortuner and the Ford Endeavour. The full-size SUV stretches 4.85 m in length, 1.92 m in width and 1.8 m in height. The wheelbase exceeds that of the Fortuner by 120 mm meaning the former will offer more space on the inside. Ssangyong has used an advanced Quad-Frame platform that uses 63% high-strength steel and 1.5 Gpa giga-steel. These lead to huge weight saving while improving the structural strength. The upcoming Mahindra XUV 700 will offer the latest and greatest in tech. Rear passengers will occupy individual captain seats with massage function. The passengers will also appreciate the latest infotainment system with two individual screens in each headrest. Wifi connectivity, Apple Car Play, Android Auto like several connectivity options to be offered as well. The new Mahindra XUV 700 will also help its passengers by assisting them through the night with the follow-me type of illumination via headlamps. The new Mahindra XUV 700 will offer segment-leading safety features as well. On offer will be 9 airbags including front, front & rear side, curtain and driver knee airbag. These airbags will cocoon the passengers in case of an accident keeping them away from harm’s way. Several additional features include Advanced Emergency Braking System (AEBS), lane departure warning, blind spot detection, lane change assist, traffic safety assist and high beam assist. Whether or not these features be able to cope with the challenging Indian road conditions, will be an affair I’ll leave for the review. Stay tuned for more info on upcoming Mahindra SUV.